The Children's Place site has a very easy-to-use currency exchange button, which will show the prices of items at the currency desired for that particular country. The Children’s Place now offers international shipping to Canada as well as 99 other countries. When you checkout online, you will see the final bill including tariffs, duties and customs fees, which actually adds a lot more money. Most of the international shoopers give us due to the high shipping rate and taxes. That is why USGoBuy is here to help! The above mentioned international shipping & taxes cause inconvenience to international shoppers, and they all hope they can just enjoy the free shipping within USA and discounted prices of the clothing. With USGoBuy it is a dream come true. 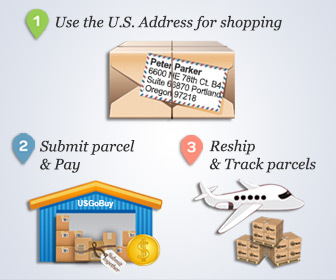 USGoBuy offers you a free US shipping address, so that you can buy from Chilren's Place just as any other Americans.This also gives you chances to enjoy free shipping within USA. If USGoBuy has your Children's Place purchases at warehouse, you can either ask us to ship out at once or you can get it consolidated with your other packages.No doubt, you will save shipping fees with USGoBuy.